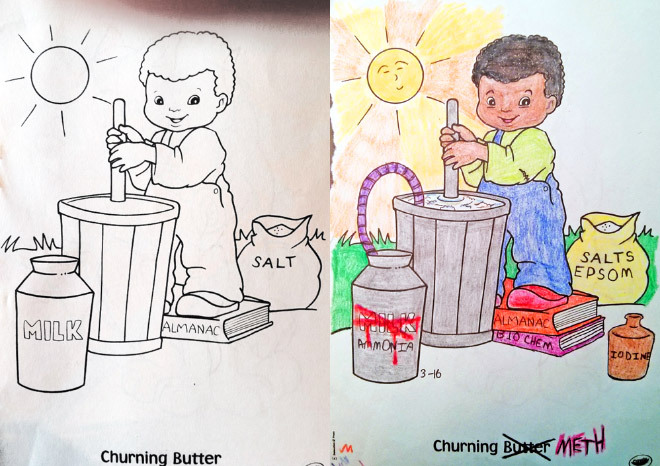 Kids are innocent and not corrupted at all, they mostly do not notice the bad sides of things and their drawings/paintings are usually a lot less corrupt than from adults. 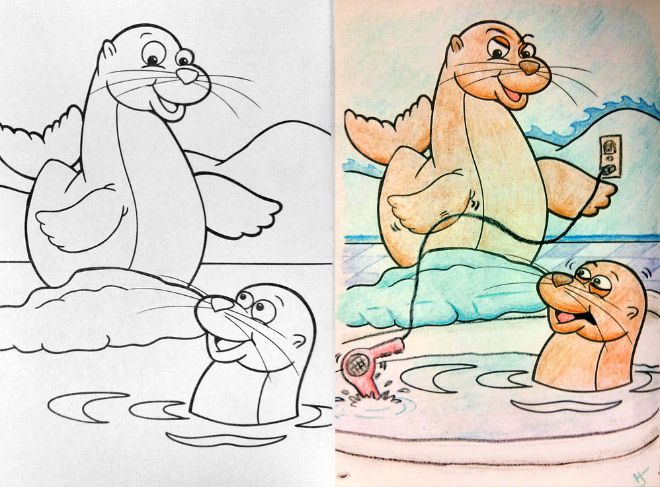 What happens when you give a children’s coloring book to a few adults and you tell them to start coloring? Hilarious stuff happens and we are sure you will want to see more after! 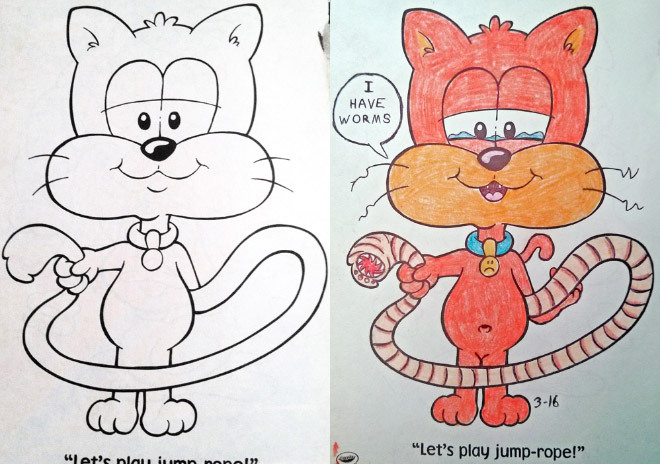 In case you wonder is there a website which gathers these adult coloring books all in one place – yes there is and it is called Coloring Book Corruptions. 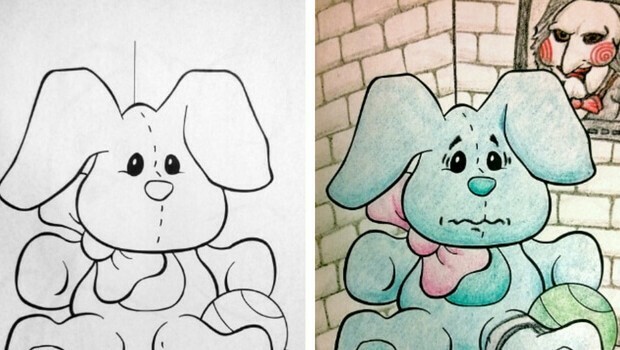 “There’s a wonderful sense of corrupted glee to be gained [in] turning a seemingly innocent children’s coloring book into something both awful and hilarious.” the creator of the Coloring Book Corruptions said. 1. 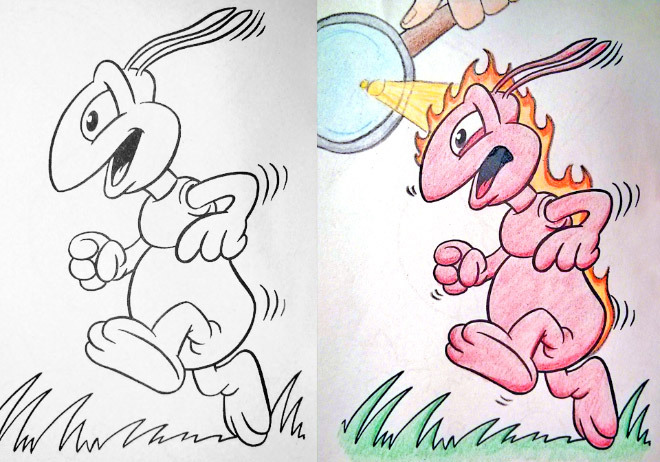 There was a lack of fire on the drawing so an adult added a couple of flames. Original! 2. An oversized belly of this cat surely does look like it has been under a worm attack. 3. Adults really know how to make it all very corrupted. 4. 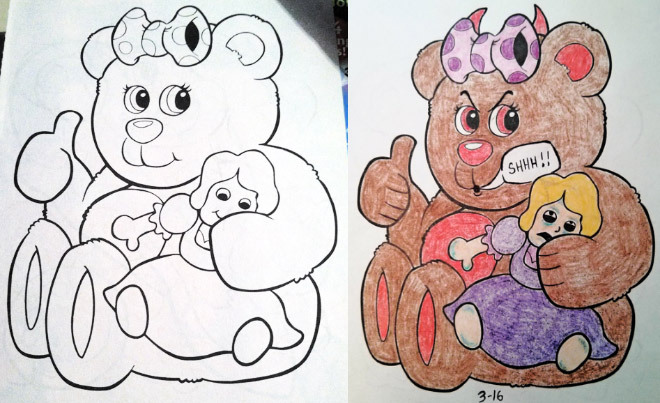 Because why would a teddy bear peacefully hold a doll. 5. 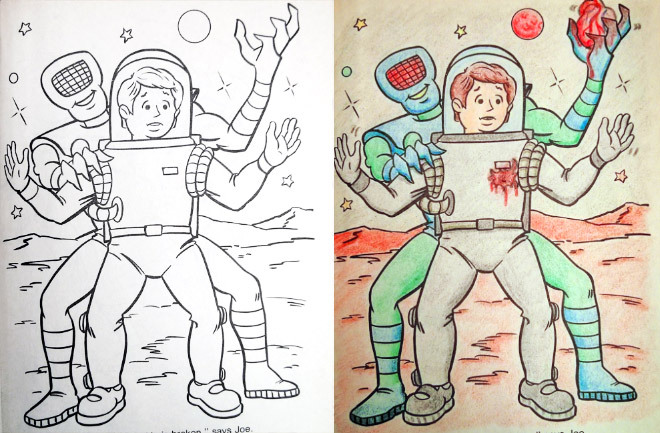 Aliens are not as friendly in a head of an adult as they are in the coloring book. 6. 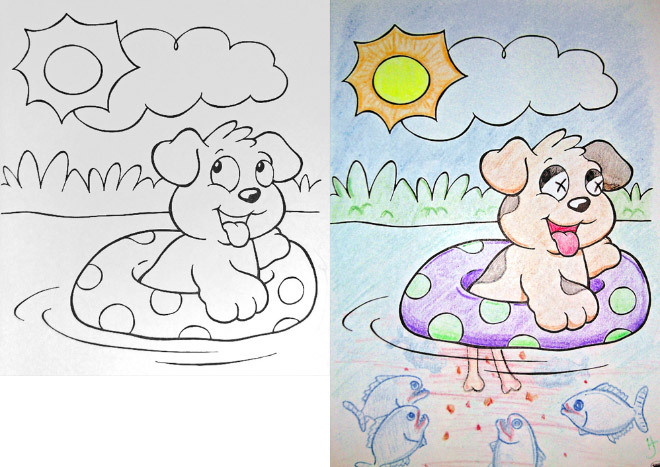 Why are there no piranhas in this drawing? 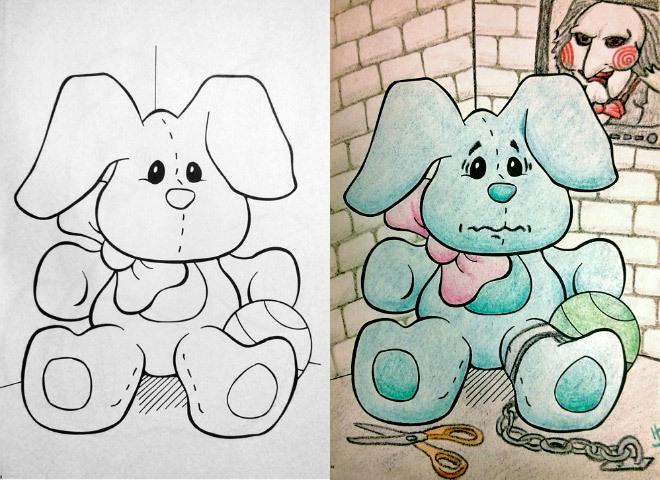 An adult had to make it morbid right here. 7. 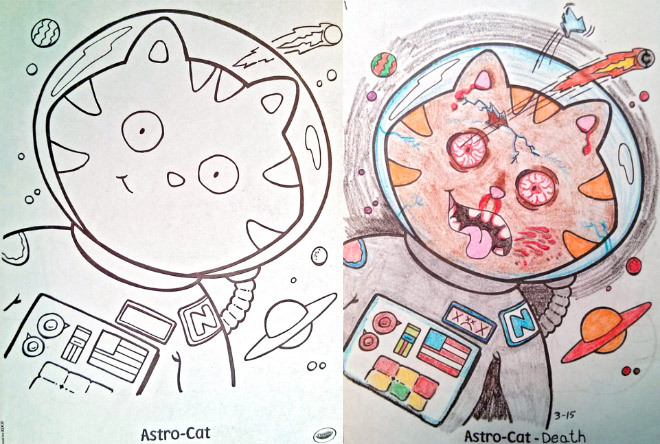 Astro-Cat turned into a Astro-Cat-Death, logical if you are an adult. 8. A rather dark perspective right here. 9. 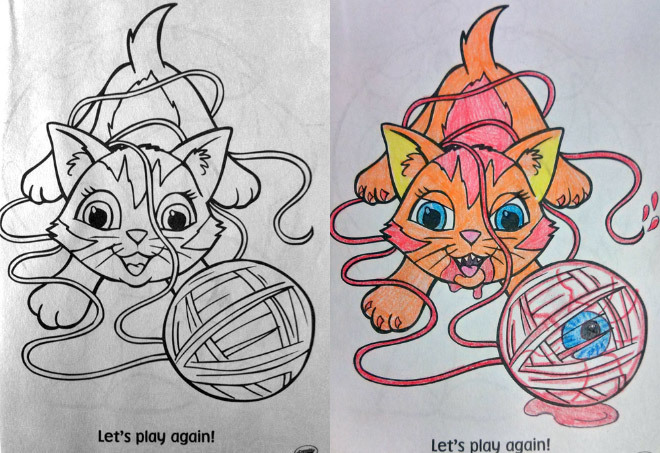 Jigsaw: Hello, do you want to play a game? Teddy Bear: No, please? 10. Why would they peacefully swim in the lake, when there is a hair dryer in it? 11. Unicorns without blood and injuries? Impossible, if you are an adult!